Am intending to write to all the firms that send me them [super injunctions] advising that in future I will exercise my own judgement when I receive them. If I judge it to be in the public interest I’ll forward the injunction to Wikileaks and take my chances in the Courts. People were genuinely positive towards the idea. The Tiger Woods media gagging injunction which we are not even allowed to mention is now uploaded by person(s) unknown on to Wikileaks. 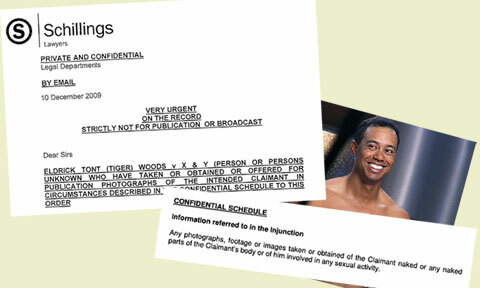 For good measure Schillings should note that there is also a picture of Tiger Woods partly naked and looking a complete w****r on the blog – a further breach of the “Confidential Schedule”. Tiger Woods is not really the issue here, freedom of the press is the issue. For example, Nigel Griffiths, an MP caught on camera with his trousers down in his office with a woman in only her stockings and suspenders, also apparently has a super injunction preventing the media from fully informing voters as to what he was up to, in the office taxpayers pay for him to work in. Enough. Guido will take his chances in the Courts.